The Suffolk Punch Horse Breed dates back to the 16th Century, although today all Suffolk punch horses can trace their male lines back to a stallion called Crisp’s Horse who was foaled in 1768 in Ufford. The modern breed originated in Suffolk in East Anglia, England. But for the breed to have been recognised in the 16th century it would be safe to assume it would have existed for a few hundred years before that. The Suffolk Punch is quite likely to have inherited the genes for its large size from horses originating in or around Belgium. The breed was originally developed as a farm horse and Suffolk Punch’s were considered to be one of the best farm horses ever produced. This was due to their immense power, which was used to pull heavy farm machinery. They were also very popular for pulling brewers drays. The Suffolk Punch has a large head, deep neck and compact body. These attribute all make it a very powerful and strong horse. The broad shoulders and chest are ideal for pulling as the weight of the collar and the vehicle to be pulled can be spread out across a larger surface area and therefore creates fewer pressure points. 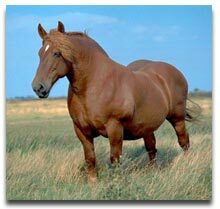 The Suffolk Punch also has rather short legs in comparison to its body size. Colour range: The Suffolk Punch coat colour is only Chestnut, traditionally spelled ‘chesnut, with no t’. A few white hairs well mixed in with the chestnut hairs of the body are allowed, as are a star, stripe or blaze. There are seven different shades of chesnut which are recognised, bright, red, golden, yellow, light, dark and dull dark. Unlike many heavy horses, the Suffolk has relatively clean legs, which make them well suited to farm work and easier to care for. The Suffolk Punch is also a very good doer, so was popular with farmers and brewers alike. It was traditional practice to house the Suffolks in a large barn and feed them as a group. This was mainly because of their good nature and the economy of feeding. Many farm horses at the time would have been tied in stalls overnight. With the development of modern machinery and transport methods, the use of the Suffolk Punch has declined. The need for more efficient farming, and the increasing mass production of crops in the 1930?s led to serious risks of extinction for the Suffolk Punch. And; although the breed was in danger then, today new breeders are developing the breed and numbers are gradually increasing. The Suffolk Punch is now mainly used as a show horse or to pull display drays. This indication is based on a surrogate wellbutrin pill purple endpoint..